Next week, Major League Baseball will begin rolling out thousands of iBeacons in ballparks around the country according to a source familiar with the plans who shared them with MacRumors. The league is looking to have twenty parks outfitted with roughly 100 iBeacons each by Opening Day at the end of March. Boston, Milwaukee, San Diego, LA Dodgers, and San Francisco are among the teams that will have iBeacons installed. The iBeacon deployment is one of the largest rollouts in the world, aside from Apple Retail's 254-store effort. MLB will be using iBeacons sourced from Qualcomm. 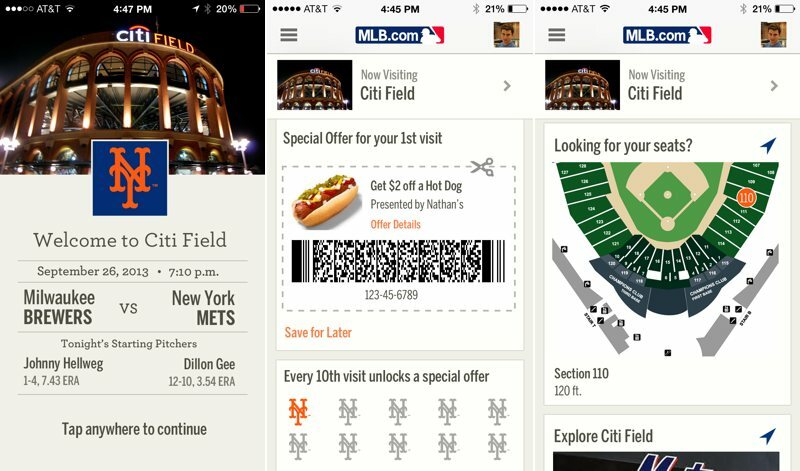 The iBeacons will work with primarily with MLB's At The Ballpark app, demonstrated at Citi Field last fall. The app should be updated by Opening Day with iBeacon support. Functionality will vary by ballpark, with individual teams having significant input and control over what users will see. There are a number of potential use cases including point of interest information, concessions, loyalty and rewards programs, shopping, and more. Specific scenarios have yet to be determined for each ballpark and teams will share more information as it gets closer to Opening Day. Separately, the NFL is rolling out a limited number of iBeacons at MetLife Stadium, the Super Bowl venue for this year, and in Times Square. The beacons will mostly be used to help users get to entry gates and to find Super Bowl-related tourist attractions in the area. 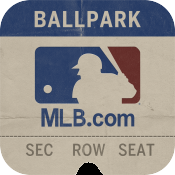 At The Ballpark already includes extensive ticketing functions introduced last year. Ticketing is fully integrated in the app and users can see all tickets they own, a significant perk for season ticket holders. Tickets can also be transferred from user to user, allowing ticket holders to send unused tickets to friends and family. With iBeacon, the app will be able to offer ticket holders precise directions to the appropriate gate and to their seats. Users can work end-to-end within the app: buying tickets, showing them at the gate, and then using the app to find their seats. The main purpose of the iBeacons, according to our source, is to improve the fan experience -- not make money. The league is taking a "longer range view" and iBeacon isn't designed to drive revenue in a direct sense. "Time is more valuable than money", so MLB wants to make the fan experience "as efficient as possible". It is looking to eliminate time wasters like waiting in line at the will call window, and it doesn't want fans wandering the ballpark looking for their seats. However, there is a significant revenue opportunity to be found. iBeacons allow fans to signal their intent, whether it's browsing for merchandise, looking for food or something else. It allows ball clubs to be more proactive at fulfilling fan needs and "it's better for you as a fan". At The Ballpark already includes a loyalty and rewards component, but with iBeacons, clubs could proactively send a push notification to fans thanking them for their tenth visit to the ballpark and directing them to a nearby concession stand for a free hot dog. The precision of the iBeacon's location determining ability varies depending on both use case and subsequent placement of the iBeacon hardware. Determining installation locations for iBeacons within a major league ballpark is a major undertaking. If installed properly, the app will be able to determine things like whether users are physically in a store versus looking in the window, or if they need to move to a different row in a particular section. MLB is also working to bring reliable Wi-Fi to all thirty ballparks, as well as working with all major carriers to improve cellular reception inside the facilities. Currently, many fans have difficulties using data or making calls, particularly during particularly exciting moments in the game. iBeacons can currently trigger any content -- videos, photos, text -- that are preloaded in the app, but for optional items like video clips triggered by plaques at Monument Park in Yankee Stadium, having reliable Wi-Fi would be a significant improvement to the fan experience. The Bluetooth LE protocol used by the iBeacons is not subject to connectivity conditions, so users should be able to get directions to their seats or other content already stored within the app regardless of the status of their cellular connection. From the screenshots its apparent that iBeacons also improve battery life and cell reception. Awesome! You do realize iBeacon works on Bluetooth low energy right and is not specific to Apple right? How do they get people to turn Bluetooth on? So, in order for iBeacons to work, Bluetooth needs to be turned on, but most people don't usually have their Bluetooth on all the time. Does anyone know how MLB or the MLB application suggests that people turn on their Bluetooth? ... I won't be attending any major league sports events anyway! How will they prevent "malicious" iBeacons diverting people to scams and phishing schemes? Wait, what? According to whom? I've never turned Bluetooth off. I'm sorry, but is this what the world has come to? "I turned my Bluetooth off and need to know who's responsible for reminding me to turn it back on." How do you remember the keys to your home? To check the gas gauge on your car? How do you remember to go to work at the right time? Uh, I did, to extend my battery life, as would anyone else that doesn't use Bluetooth and wants to not waste power. I don't think you're being fair at all. What was unfair about my response? I usually have bluetooth off because I don't use a headset nor have a car that uses it. I don't want it on so I can extend my battery life. I think he just wants a little pop up window to tell you to turn on your bluetooth when you're at the park. But you're essentially describing an infinite loop. You turn off BT because you don't use it, but you want something to tell you to turn it on in case you want to use it. How does that make any sense? The iBeacon system uses BT to provide the service--why would you expect it to work if you've manually turned your BT off? That is, by turning BT off manually, you've already told the device that you're not interested in using BT. I can't imagine how infuriating it would be to have a window pop up to tell me to turn on BT every time I passed by a BT device. I don't think you guys are actually thinking about what you're asking for here. To do what you want, you'd have to do one of the following: A) BT could never really be turned off because it needs to be able to accept a request to display a reminder message on your screen, or B) you'd actually have to add an entirely different wireless service to the iBeacon protocol to send a request to display a reminder message, which seems like it would double the level of complication for the service. I don't think it's unreasonable, nor worthy of your kind of sarcasm. I'm 100% serious. What part did you think was sarcastic? How is remembering to turn your BT on any different than remembering to do virtually anything else in life? You're asking for a feature that's so advanced that it knows before you do that you want to use it. Anyway, it's totally unreasonable and starts smartphones down the road of just displaying reminder messages all day long about things that you MIGHT POSSIBLY want to do, which defeats the purpose of the device altogether. I turn mine off sometimes to conserve battery, but think it is within my meager capabilities to switch it on if need be. Sure, that's the reasonable solution for me as well. Expecting the device to tell you to do something ("turn on your BT") after you've specifically told it you don't want to do something (you turned BT off) seems antithetical to having a smartphone at all. It's exactly the same as turning your car radio off but expecting it to automatically turn on if a station happens to be playing a song you like. Hell, it would make more sense to be able to turn off all BT connections but those from 4.0 devices, but that's not the argument that was presented. "loyalty and rewards programs" is the most interesting part for me. In the provided picture it knows that it is your first time at the stadium and offers a coupon. I use foursquare but sometimes forget to open it and never aware of any deals where I am. If this setup would auto detect and send a push notification then that would be nice. At the Orioles' stadium, the check in feature is linked to Four Square. Check in through their app and you're also checking into Four Square (or Twitter or FB). There are no applications written for Android to take advantage of iBeacons. So while BLE itself is not proprietary, iBeacon is.